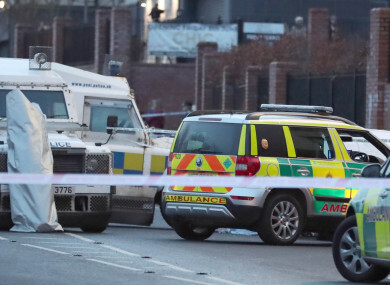 TWO MEN HAVE been arrested in connection with the fatal shooting of a man outside a school in west Belfast on Tuesday. The victim, named locally as Jim Donegan, was sitting in his car when he was approached by a lone gunman at around 3.15pm on Tuesday. He was then shot several times, including at least once in the head, the PSNI confirmed. Following a number of searches in the west Belfast area yesterday evening, two men aged 49 and 51 were arrested by detectives investigating the murder. Following a number of searches in the west Belfast area this evening, two men aged 49 and 51 have been arrested by detectives investigating the murder of Jim Donegan. They are currently in custody. It is believed that the gunman escaped on foot, from the Glen Road beside St Mary’s Grammar School, wearing a hi-vis jacket with the word ‘security’ printed on the back. CCTV was released yesterday of the man on his way to and from the scene of the murder. The man is seen wearing a high visibility, hip-length yellow jacket, with ‘Security’ written on the back, dark bottoms, with a grey coloured hat or hood and carrying a black or dark bag over his shoulder. “I believe the gun was in this bag,” Detective Chief Inspector Pete Montgomery said in a statement. He emerged from a lane in Clonelly Avenue onto the Glen Road around 3.10pm, walked past countless parents and children, before firing eight bullets at Jim while he sat outside the school in his red Porsche Panamera, registration JDZ34. Montgomery said that after the shooting the man ran back up Glen Road and along the lane into Clonelly Avenue. He appealed again for any information on the shooting. An incident room has been set up in Musgrave Police Station and anyone with information can contact detectives there on 101 quoting reference 741 04/12/18. Email “Two men arrested in connection with fatal shooting of man outside Belfast school”. Feedback on “Two men arrested in connection with fatal shooting of man outside Belfast school”.